There are some 70,000 irises in 15 different classes registered with the AIS (American Iris Society). This does not include Dutch bulb irises or dwarf bulb iris varieties in the juno and reticulata classes, which are included in the International Bulb Registry along with tulips, crocus, etc. Approximately 40,000 of AIS registered irises are Tall Bearded (TB) cultivars and more than 90% of the irises submitted for identification are TB varieties. At this time, some 40-80% of TBs are estimated to be extinct. Whether actually extinct or technically extinct, i.e., have lost their identities, is not known. In addition, many irises commonly passed from garden to garden are unregistered, open-pollinated backyard or hybridizer seedlings and there is virtually no data available on how many irises this might include. For many older varieties there is no photo or poor photo documentation. Inadequate descriptions with insufficient details were common in early AIS checklists. 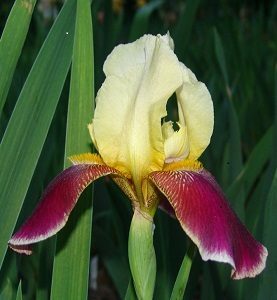 Another relevant factor is that iris seedlings can often be indistinguishable from a parent plant so photo identification is unreliable and even a trained eye may not be able to distinguish between clones. Additionally, the appearance, depth of color, and height can vary from year to year and garden to garden, influenced by climatic factors and soil conditions. Simply said, once an iris loses its identity, it is rarely recovered and any conclusion regarding an iris identity cannot realistically extend beyond “it appears to be so and so.” In the future, DNA testing may provide reliable grounds for accurate identification, if compared to a known clone with accepted provenance. This introduction is meant to acquaint a party submitting an iris for identification to consider the challenges such a task presents. 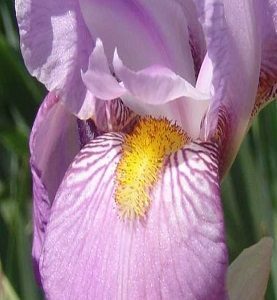 The good news is that if you have an iris that you love, its enjoyment will not be diminished, and may perhaps be enhanced, by the unknowns surrounding it. 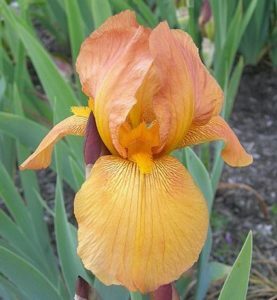 An iris with a known pedigree cannot provide the intrigue that the mysterious origins and story of the iris raising its skirts and dancing before you presents. Who is she, where did she come from, how did she get here? An orphan like that brings unique ambiance to any garden. These irises are worth preserving as well and efforts are underway to assemble them into collections and determine a means of cataloging them. Having read the preceding Introduction, you are now acquainted with the challenges of iris identification. When filling out the application form below, please keep in mind that the more information you can offer, the better opportunity there will be for identifying your unknown iris. The requisite photos are particularly valuable. We hope the sample photos provided below (see photo request) will assist you in how to take photos from angles that offer important identification details. The application form is divided into two areas: mandatory questions and optional questions. Please note: all mandatory questions are listed first with notation they are required. Your form cannot be submitted without answering the mandatory questions. “I don’t know” is a legitimate response but the more information you can provide, the more you will assist the ID Committee in identifying your iris, and chances are better to get results. If you need assistance with the application form, please contact the Webmaster Laetitia Munro at webmaster@historiciris.org. For those who wish to submit an application via mail, please send your answers to the mandatory questions to Laetitia Munro, 49 Hilltop Ave, Newfoundland NJ 07435. Printed photos are still required but they need not be limited in size. Three photos are required. Samples are provided below. They should be closeup shots of single blooms. Ideally, photos should be of freshly and fully opened flowers. Please do not submit photos of flowers with rain or water on them. Peak time for taking pictures is in morning or early evening and not in direct sunlight. Please try to take a photo that is around 1 MB in size; some emails will not forward photos if the photos are too large. If you would like to submit additional photos that highlight further details, please feel free to do so. HOW BIG IS YOUR BLOOM?